What are you looking at? : Yes, I cried. Do you think I'm made of stone? Yes, I cried. Do you think I'm made of stone? Don't worry, this post isn't in lieu of TLF, but I just had to share the beautiful surprise I received this morning at work. This isn't the first time Luke's sent me flowers in a corporate setting, but it is the first time I've gotten them here, and I was completely floored. Aren't they pretty? They are so, so pretty. I am one lucky woman. Thank you, honey! Are they for no particular reason? The best reason of all, I think. Lovely flowers, lovely husband. Please have Luke get in touch my hubs and ask him to share HIS FLOWER-GIVING TIPS. Thank you. They are beautiful. I love Gerbera daisies! Awww. So pretty! Good job, Luke. Ditto all of Liz's comments. Awww, they are so pretty!! 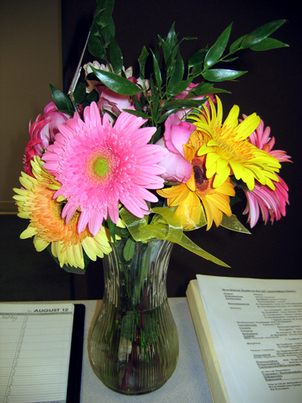 I have to say, Chris is pretty good about sending me flowers at work, but I am always surprised when he does it. Luke is so sweet! The pink flower is awesome. They're gorgeous! That Luke sure knows how to treat his wife right! Love 'em! There's nothing better than receiving a bouquet of pretty flowers. Way to go, Luke! can you send your man to give my man lessons? Oooo, pretty! :) Luke is a sweetie! Those are my fave flowers! Are you sure he didn't mean to send them to me? Just kidding! They are gorgeous, you lucky girl!